Sanssouci Palace from the Great Fountain. 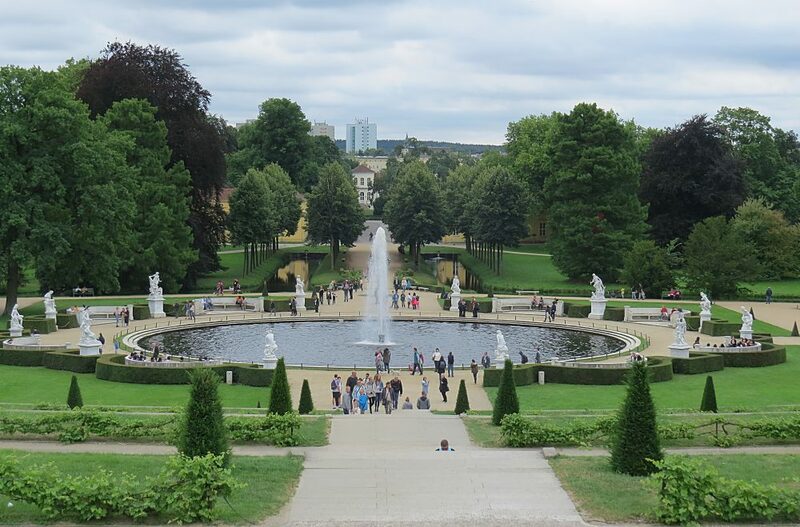 No description of Sanssouci would be complete without reference to Louis XIV’s great palace and garden landscape at Versailles. 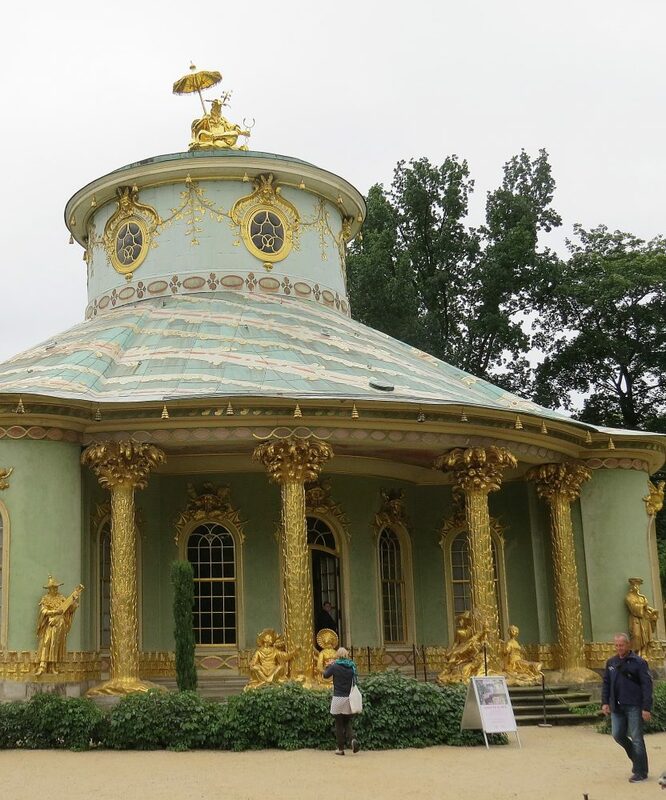 This was such a statement of power, splendour and taste that even 30 years after Louis’s death, diminutive copies were still popping up in the minor kingdoms, duchies and principalities of Europe, and none more unusual than Frederick the Great’s Sanssouci. To say that Frederick had a disturbed childhood would be an understatement. His father Frederick William I, the Soldier King, turned Prussia, a small second-rate European power, into ‘an army with a state’. Described by Frederick as ‘a terrible man ……. skilled in the management of affairs’ he beat and humiliated his artistic son who in his youth formed homosexual attachments. His father had one of Frederick’s intimates, Hans Hermann von Katte, decapitated in his presence. Frederick never had children, and soon after his accession banished his wife to a palace at Niederschonhausen. Frederick was a brave soldier leading his highly-disciplined army into battle and in his forty-six year reign won many military victories, consolidating the vulnerable and disconnected lands of Brandenburg and Prussia into a single state, and turning it into a major European power, But Frederick also brought the Enlightenment to Prussia, patronising the arts, promoting education, encouraging a scientific approach to agriculture and industry, allowing a free press, and corresponding with leading scientists and philosophers. 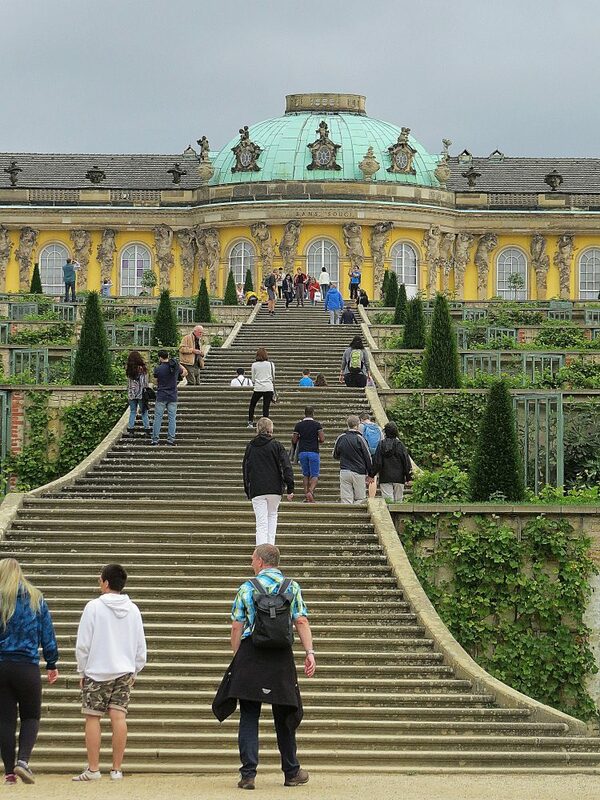 In 1743 Frederick bought the ‘desolate hill’ that was to become Sanssouci with its broad southerly views of the River Havel, and plans were drawn up, based on his own design, for a summer retreat that would be the Prussian Versailles – ‘sans souci’ meaning ‘without care’. The grandiose New Palace, built some twenty years later at the opposite end of the 740 acre (299 hectares) park was little used by Frederick except for entertaining and impressing foreign dignitaries, whereas the small rococo palace of Sanssouci built in 1745-6 was a place where guests who shared his interest in art, philosophy, music and poetry could join him for dinner and conversation. 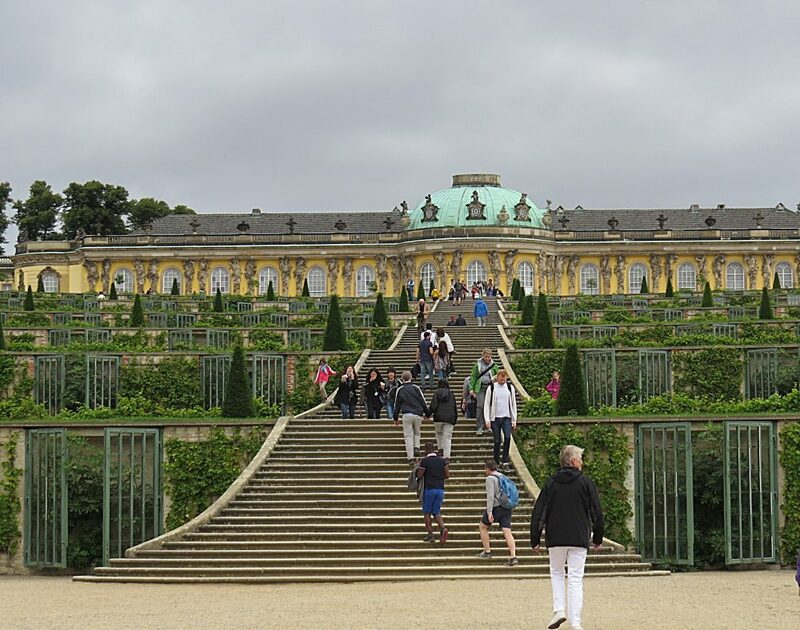 Frederick’s Enlightenment sentiment at Sanssouci was expressed thus: ‘Whoever improves the soil, cultivates land lying waste and drains swamps is making conquest over barbarism’. The Eastern Pleasure Ground was laid out in 1745-6 with beech-hedged subdivisions planted with fruit trees, whilst the Western Pleasure Ground was a series of tree-lined groves framing the parterre around the Great Fountain with its marble statues celebrating classical antiquity. Greenhouses and nurseries produced oranges, melons, peaches and bananas and his kitchen garden was well-tended and productive. On the hillside in front of the palace three broad parabolic curved terraces designed to catch the sun were laid out, divided by a grand, formal sweeping staircase. Against the warmth of the brick walls, vines were planted and figs placed in a series of glazed niches designed to shelter them from the worst of the winter weather. Each terrace was subdivided into a broad path with small circular ponds and a strip of lawn planted with yew pyramids, whilst on the uppermost level large trellised arbours, reminiscent of Versailles, were constructed. The vine-planted terraces are Sansouci’s most iconic feature, but the follies in the park are also worthy of mention. 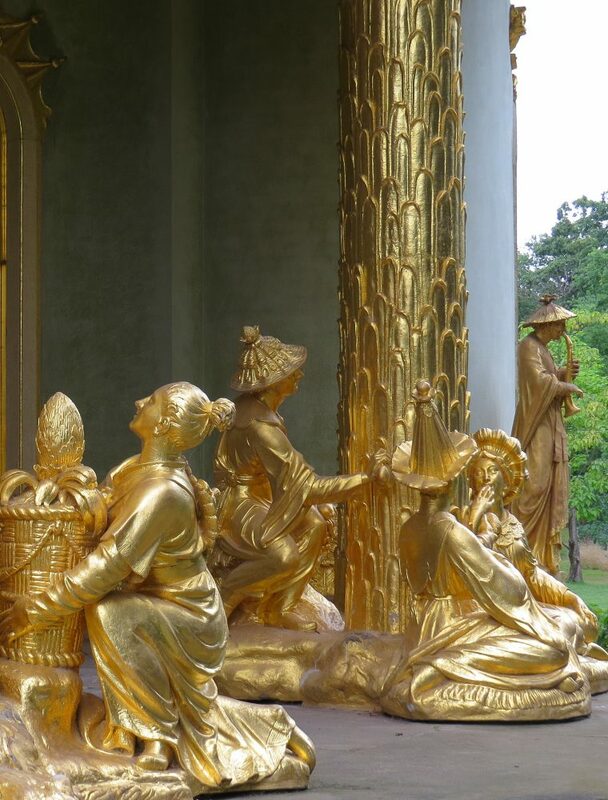 Of these, the spectacular Chinese House is the most important, being a superb, carefully-restored circular pavilion, surrounded by gilded sandstone life-sized figures and topped with a golden umbrella. This, and the other follies in the park seem strangely out of character with his wish for a simple rural retreat. By the 1820s the fashion for romantic landscape saw much of Frederick’s design overlaid but the most important features survived intact, and in the 1840s sympathetic additions were made to the palace. Following the recognition of the historical importance and unique qualities of Sansouci, the palace and park became a UNESCO World Heritage Site in 1990 and reunification proved to be an impetus for the restoration of Frederick’s original landscape. Whereas Louis XIV declared ‘L’etat c’est moi’ (‘The state is me’), Frederick spoke of his role as ‘the first servant of the state’ and wished to be buried ‘without pomp, without splendour and without ceremony. I have lived as a philosopher and wish to be buried as one’. 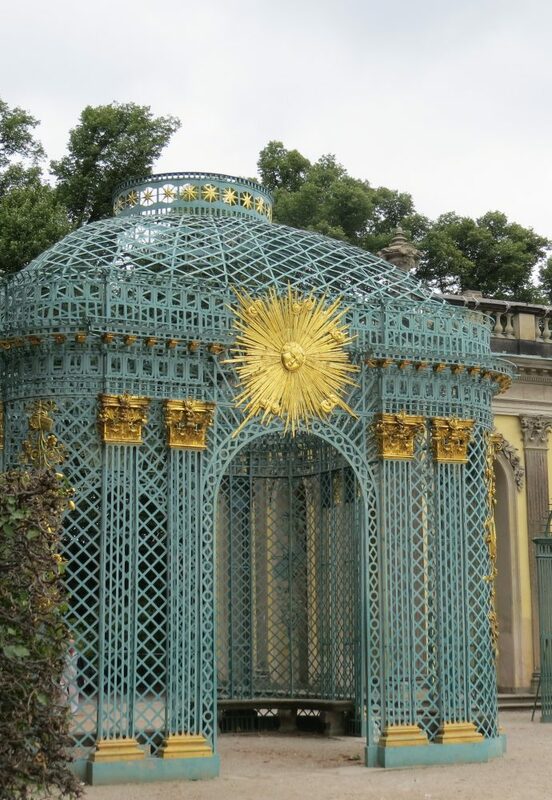 At Sanssouci, Frederick’s delightfully ornamental agrarian vision managed to subvert Louis XIV’s grandiose concept at Versailles into something quirky, fascinating and original.